I love this little gal. She has the sweetest little face and so many little bottles and pouches. 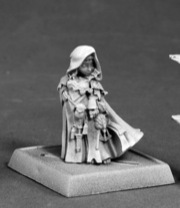 A really lovely mini, beautifully sculpted. Had the Hobbits had Enora, they wouldn't have needed Gandalf, and then what a story, eh? Sign in to start a discussion about Pathfinder Miniatures: Enora, Iconic Halfling Arcanist!